Most boaters bound for the San Juans from central Puget Sound will have entered the archipelago prior to reaching Peavine or Obstruction Pass. 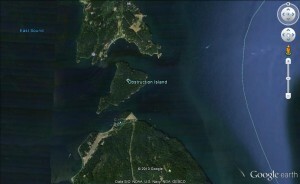 The two passes run on either side of Obstruction Island, between Orcas Island to the north and Blakely Island to the south. Peavine Pass, immediately north of Blakely Island, is the more popular passage. Navigation is reasonably obvious, although a deliberate and well charted course will be required. Currents are more significant in Peavine and Obstruction Passes than in Lopez or Thatcher. On several days each year, the ebb current in Rosario Strait is 3 knots or better. Ebb at the west entrance to Peavine Pass will be 2.2 times as rapid, or between 6.5 and 7 knots. During those extreme tide changes and Peavine or Obstruction Passes should be approached with caution or avoided.